hospital | Midwives, Doulas, Home Birth, OH MY! Yesterday, Peaceful Beginnings Doula Services had a combination vendor table for my town’s annual “Healthy Baby Extravaganza” with Rolla Friends of Missouri Midwives and Talk-Birth Childbirth Education Classes. I’ve presented a table at this event in previous years, but this year was (by far) the most productive….both in a positive and a negative way. Last year, my attention was inevitably drawn to the local hospital’s table, which was giving away formula company sponsored bags. I was horrified at the message I knew they were sending, but felt powerless to do much more than mutter a question while trying to appear disapproving. This year, though, the stakes were amplified. They were giving away not only coupons for formula, but also cans of formula! The hospital! The “nutrition” department of the hospital! 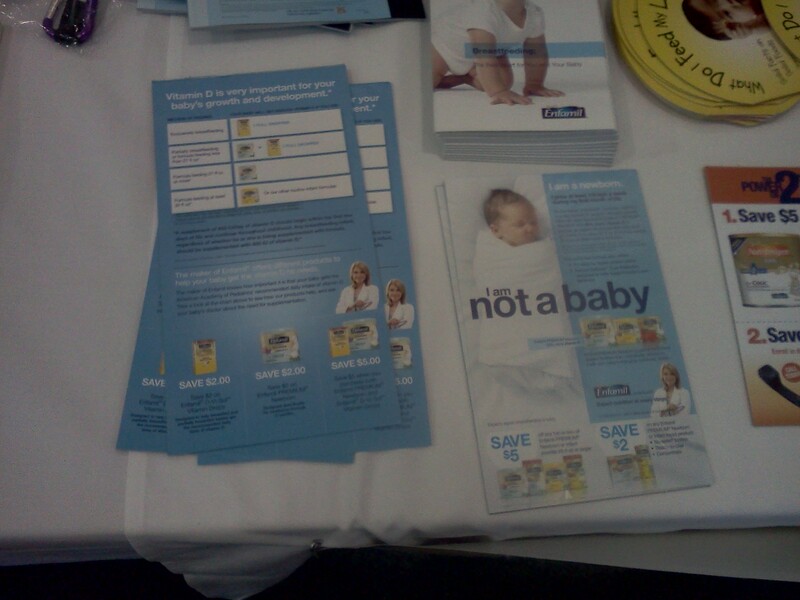 Display of free “Baby Organizer” given out by the hospital to attendees, supplied by Similac. Notice the picture of a formula can? The WHO Code specifically states that “gifts”, such as these bags, should NOT have a specific product advertised! This year, I got angry (with a little help from my colleague, who was even more disgusted than me) and decided to broach the topic with the vendor. I went to the table and perused the items, then casually asked, “Doesn’t this violate some kind of code from the World Health Organization?” The person looked at me like I had three eyes. She explained that the person I wanted to talk to was the Lactation Consultant, who very clearly had her own table with no formula in sight (in fact, she had a handout that cleverly stated “You don’t need a coupon for breast milk because it’s FREE!”). The person went on to tell me that she wrote away to companies for donations to the table and simply puts out what they send her. I got a bit braver and a bit more insistent that there are rules in place about hospitals not marketing formula, but still got very little response. Ultimately, I know it wasn’t that particular person’s fault. She had no idea and was only doing her job (well, sort of….there could have at least been something somewhere on the table about breast milk and as a nutritionist, she surely knows about the difference between the two). The hospital has a responsibility to ensure their employees, especially those who work with mothers and babies, are aware of the Code, follow it and support accurate information about infant feeding. “5.1 There should be no advertising or other form of promotion to the general public of products within the scope of this Code. Let’s read that again, “Such supplies should ONLY be used or distributed for infants who HAVE TO BE FED ON breast-milk SUBSTITUTES”. Now, if the vendor is handing these out to every single parent who walks by her table, then that is in DIRECT VIOLATION of the Code. 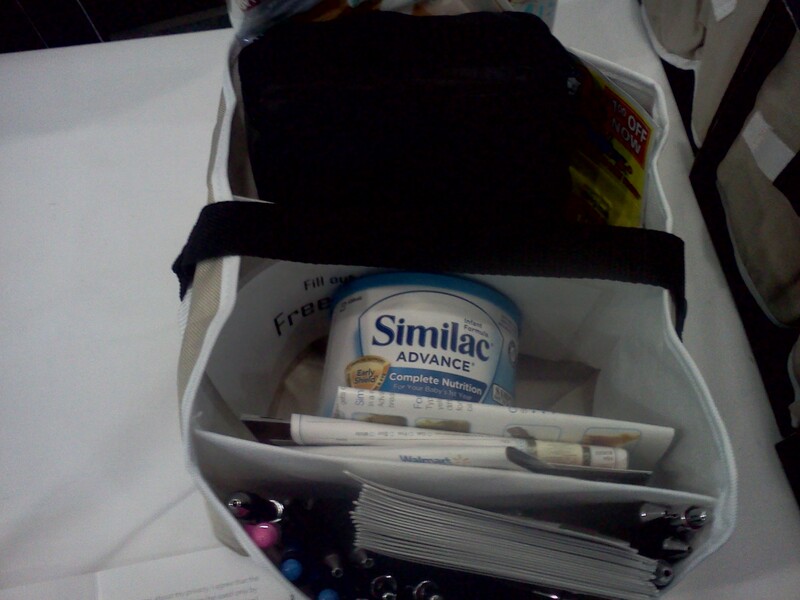 These bags and coupons were handed out to pregnant women, fathers, grandmothers….whomever wanted one was welcome to it. This Code was adopted in 1981, six days before I was born. Yes, 30 years ago and yet many hospitals, doctors offices, magazines and formula manufacturers STILL do not follow it. We still see so many advertisements in mainstream media (a DIRECT violation! ), not to mention the numerous television shows and movies that popularize bottle feeding. My irritation at PCRMC’s obvious lack of support for breastfeeding and informed decision-making spurns me to want to take action. How do I help? Who do I contact? How can the information get out to the community (and the health care systems in the community) that tactics like these *directly* affect breastfeeding? For starters, I intend to write a letter to the Editor of our local paper. Next, I will send letters to the administration/policy makers at PCRMC. Finally, I hope to attend as many fairs as possible and will be sure to discuss the risks of not breastfeeding, as well as provide resources and support for those interested in breastfeeding. I want to be clear, though, that this is about policy, policy makers, formula manufacturers and NOT about any one person who has done/not done something. The staff I have encountered who work the most in close contact with motherbaby (generally the L & D nurses and LC’s) at PCRMC genuinely care and are, for the most part, incredibly supportive of breastfeeding. In recent years, there has been a significant increase in breastfeeding initiation rates, a new breastfeeding clinic, a support group for mothers and even the adopting of skin-to-skin immediately after birth. I applaud these changes and hope to see more just over the horizon. The appearance of formula at an event table provided by the hospital is in complete opposition to the hard-working efforts of these people, which is part of why it is so shameful. Breast milk is food for babies. Human breasts make milk for human babies. It can not be replicated and anything other than human breast milk is sub-standard and should be acknowledged as such. It should NOT be marketed to everyone, but available to those who need it. All health care systems should actively encourage and support breastfeeding for the health of our babies and mothers.